Updated Jan. 30 at 9:30 p.m. ET | President Donald Trump fires acting Attorney General Sally Yates hours after she instructed Justice Department attorneys to not uphold the executive refugee and immigration ban. In a statement, the White House said Yate “betrayed the Department of Justice by refusing to enforce a legal order designed to protect the citizens of the United States,” adding that the executive order was approved by the department’s legal counsel. “Ms. Yates is an Obama Administration appointee who is weak on borders and very weak on illegal immigration,” the statement continued. The White House named attorney Dana Boente to serve as acting attorney general until Senator Jeff Sessions is fully confirmed by the Senate. 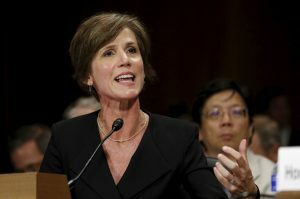 WASHINGTON — Acting Attorney General Sally Yates, a Democratic appointee, on Monday directed Justice Department attorneys not to defend President Donald Trump’s controversial executive refugee and immigration ban, joining a growing group of administration officials distancing themselves from the new president’s order. Her directive was likely to be temporary, given that Sen. Jeff Sessions, Trump’s pick for attorney general, will likely move to uphold the president’s policy. Sessions is awaiting Senate confirmation. Still, it set up a dramatic standoff between a president and his own Justice Department just days into his tenure. More: rare but not unprecedented for DoJ to decline to defend a law or executive order. Obama DOJ refused to back Defense of Marriage Act. Trump responded Monday by accusing Democrats of delaying approval of his Cabinet nominees for political reasons. “Now have an Obama A.G.,” the president wrote on Twitter. The Senate Judiciary Committee is expected to approve Sessions’ nomination Tuesday and he could be approved by the full Senate soon after. Yates’ abrupt decision deepened the discord and dissent surrounding Trump’s order, which temporarily halted the entire U.S. refugee program and banned all entries from seven Muslim-majority nations for 90 days. As protests erupted at airports over the weekend and confusion disrupted travel around the globe, some of Trump’s top advisers and fellow Republicans privately noted they were not consulted about the policy. At least three top national security officials — Defense Secretary Jim Mattis, Homeland Security Secretary John Kelly and Rex Tillerson, who is awaiting confirmation to lead the State Department — have told associates they were not aware of details of directive until around the time Trump signed it. Leading intelligence officials were also left largely in the dark, according to U.S. officials.